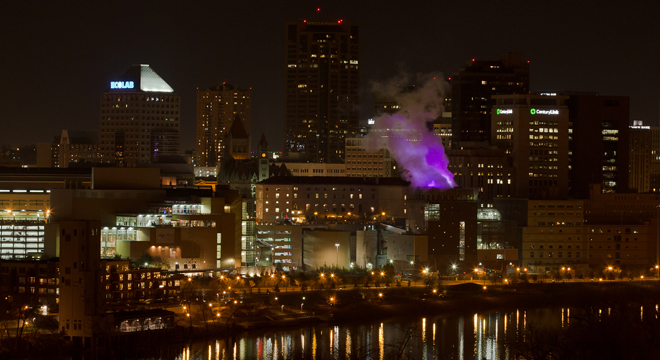 An illuminating conversation about public art and energy with one of the artists lighting up the St. Paul skyline this winter. 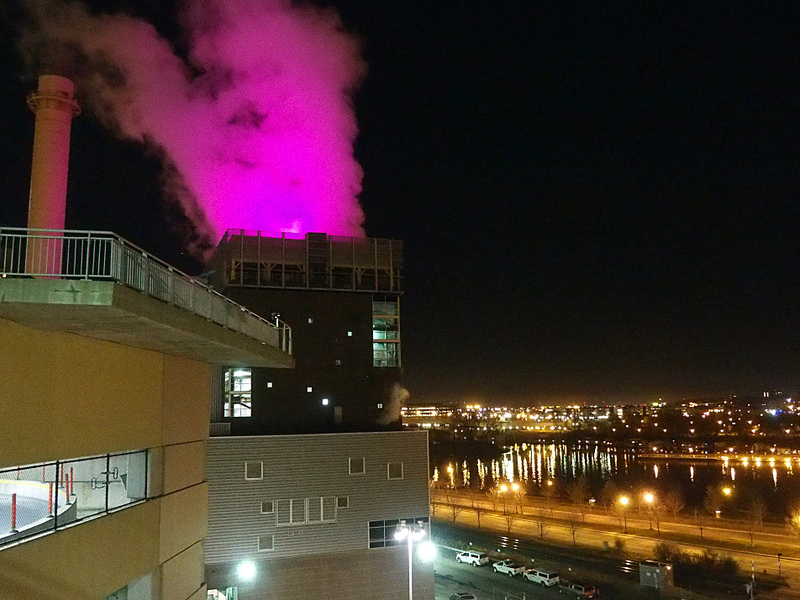 If you drove through St. Paul at night in late November, you might have thought the District Energy steam plume was possessed. If you had called the number projected on the side of the building, you would have found out it kind of was. 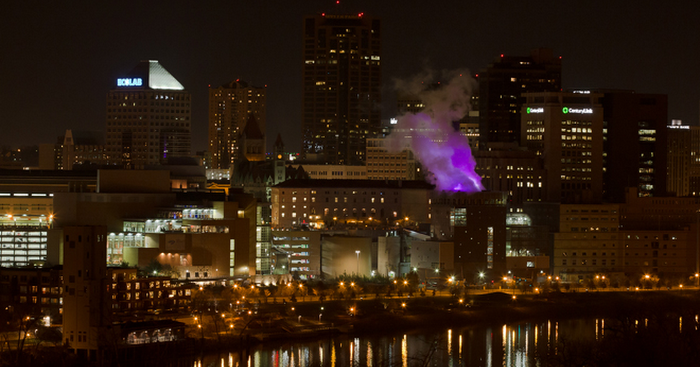 The Plume Project, a collaboration between the power plant and three artists from the City Art Collaborator, uses lights and projectors to transform the ever-present plume of white steam wafting above downtown St. Paul into three different works of art. Solar System, local sculptor and teacher Aaron Dysart’s portion of the project, is the second installment and kicks off Wednesday, December 23. Dysart and his team of technicians will be using live-streamed data about the surface of the sun from a NASA satellite to create a light show that is constantly in flux within the steam plume. He sat down with Russ White to talk about public art, sustainability, and the fine art of collaboration. Russ White: To start, tell me about the project. Aaron Dysart: There’s a long, drawn-out history to this project. It really started out of this group through Public Art St. Paul called the City Art Collaboratory, which was 50% artists and 50% scientists and engineers. Basically, the group would tour a city infrastructure site every other month to see the space and ask questions. The second year when I was one of the artists we toured District Energy. Normally this tour lasts an hour; I think ours turned into four, because everyone kept asking questions. Everything is really intense; it’s a power plant which is pretty crazy, but what they do in there and how they try to be as efficient and sustainable as possible was really fascinating. The next month we had our meeting with Nina Axelson, the Vice President of PR at District Energy. She came just to chat, and everybody kind of fixated on the plume because it is so aesthetic and so public...it is the output of the plant that people really misunderstand because they think it’s smoke and it’s just steam. That idea really resonated with everyone. RW: It’s the kind of thing where it looks like pollution but is actually the opposite. It’s actually a symbol of energy efficiency. AD: Exactly. So how can you perform a simple switch of understanding, from revulsion to appreciation? People started firing off ideas. I did not come up with the Plume Project by any stretch, but I do remember asking Nina, as a joke because I have done a lot of work with disco balls, could we throw a disco ball up there? And she said, “yeah, I think we could do that.” Not jokingly—she was even taking notes. I said that it would require bolting stuff onto the side of your building, making sure it’s safe etc…she wasn’t phased...this complete willingness for her to say, “yeah, I think we could do that,” completely blew my mind. After that, Andrea Steudel invited Emily, Asia, and myself to start brainstorming about ideas over a campfire, with a pot of water and a projector. The Knight Arts Challenge came up as a funding opportunity, and that really forced our hand to think about what we wanted to do. When writing that grant, we came up with the idea of doing three separate smaller projects. As a group we would work through, coordinate, and organize the whole thing with legal stuff, budgeting, and fundraising etc, but the artistic aesthetic of each project was to headed by one artist. RW: Yeah, you’re collaborating but with your own autonomy at the same time. AD: All three of us have had different roles in the overall project. But when Emily’s debuted, that’s her idea and her project, same with Asia’s and mine. We are three artists with different interests and working methods, we help each other with logistics and critical feedback, but in the end, this is your project that has the support of the group. RW: So for Solar System, your part of the Plume Project, it’s like a live feed of the surface of the sun? AD: Yeah, It takes about 8 minutes for the light to reach the satellite, and there is a data dump from the satellite every three minutes. Five points are mapped on the equator of the sun, which is the most active part of the sun. Each one of those positions is tied directly to a light in the plume. The program takes the standard deviation of the sampled set, and then based on that number it dictates how bright that light is. Also if it is a high standard deviation (more volatile), the light itself will fluctuate faster. RW: At first, I thought you were simply projecting a video of the sun’s surface onto the plume, but it’s actually much more technically demanding and visually abstract than that. AD: I’m a strong believer in the visual being primary, but I readily admit that if you don’t know how the show is being generated, you won’t get the connection to the sun. First and foremost it has to be beautiful and compelling and then, upon investigation, it has all these multiple layers that can be discovered. It is tied to the sun both directly and conceptually and for me, the light show is kind of like the hook into the complexity of the piece. RW: The first of the installations, Emily Stover’s Rumblings, ran November 17 – December 8 and featured lights that strobed to the rhythm of pre-recorded poetry spoken over the phone to anyone who called in to a hotline. Was there a good reaction to that? Did people engage with Emily’s show? AD: Yeah, everyone loved it, and it has gotten great press and amazing community support. I’m not even a huge poetry fan, but there was something really compelling about being the only person that could hear it at a time and this personal experience was just so public. I was up at Mounds Park and dialed the phone number and all of a sudden the plume lit up instantly. It was pretty wild. RW: Did it only light up when people called? AD: It had a throbbing white light like a heartbeat until someone called, and then that would go down and the colored lights would come on and match the rhythm of the poem. RW: So everyone in the city could tell when somebody called the hotline? That’s amazing. AD: Yes, it was great. RW: What do you hope is the take-away from your piece? AD: I first want to make something visually compelling. If it is compelling enough people will start digging deeper, and I hope they think about the sun’s role in life and the role of the plant within the city and what’s central to their lives. This local plant and the sun are at the center and origin of power and are things that drive our existence. One is next door, another is light years away, but both are taken for granted. In addition, I just want people to know how amazing this power plant that uses sustainable biomass is. RW: How long has it been operating this way? AD: 30 years? Twenty-five, thirty? I forget, and it has this amazing history. The whole system district energy of sending hot water in throughout the whole city, heating around 80% of downtown sustainably…they were even the only plant of their kind in the states recognized by the UN. I’m fascinated by it and proud to have it in the cities, but the subtle power of its location is truly amazing. What I’ve always loved about that plant is it’s on a major thoroughfare in the city rather than the suburbs or someone else’s backyard. It’s right in the middle of where it is needed. If we want power, if we want heat, we need to know what it takes to get it, and here’s a sustainable way to do it, right here in the middle of the city. When I started thinking about, what’s the source of all power, it’s the sun, which is in the center of our solar system. It’s that linking the center of the city to the center of the solar system through distinct points that really excites me. RW: And it seems like this project speaks to people taking things for granted: having this power plant, seeing this plume and not knowing what it is when it is heating their homes. AD: And that’s the hope. The plume is this thing that people malign, and it should be one of the things people are most proud of. 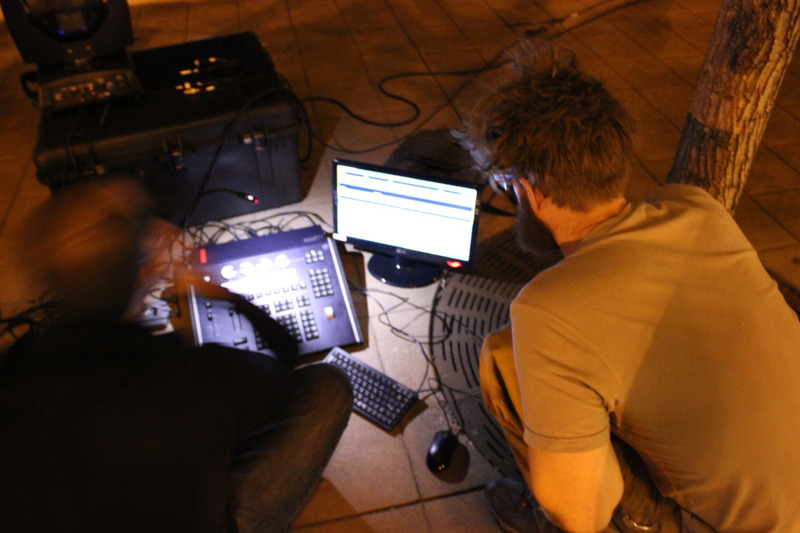 This sounds like a cheesy sound bite, but when we did the first test with projectors and lights well over a year ago, some of the workers came out to see what we were doing. We told them about the project and what we were trying to do, and one of the workers said “thank you”, because each panoramic shot of St. Paul from the river on the news always stops at the plant. They won’t show it because they think it’s not scenic. And we just said no, we should be saying we have this right here, and we should be really proud. Solar System will be on view every night through January 12th. The third and final installation, Asia Ward’s Plume Coloring Contest, will run during the St. Paul Winter Carnival from January 28 to February 7. For more info and to submit to the Coloring Contest, visit http://www.plumeproject.com.